Best of house? Try Best of Houzz! We are thrilled to announce that we are the recipients of the Best of Houzz 2016 award in Customer Service. We are humbled by this immense showing of support, and delighted to accept this award for the third year in a row! Whether you’re a homeowner interested in spicing up your space or simply a design enthusiast, Houzz, Inc. is the go-to guide for anyone in the business of building, remodeling, or decorating. Each year, the Houzz community votes in three categories—Design, Customer Service, and Photography—and we are honored to be rated at the highest level for client satisfaction. We believe in setting a standard for excellence in every aspect of our work and we strive to provide each of our customers with the best in quality design and innovative solutions. Of course, we would be nothing without you, our readers and wonderful customers—to you, we say, thank you for your support, your loyalty, and for making it easy for us to do what we do and love it too. 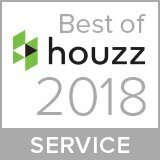 To the Houzz community, as well, we offer thanks and gratitude for recognizing our dedication and celebrating the art of professional home design.